Father’s Day is coming out soon. This day would be dedicated to the guy whom we call Dad, Daddy, Papa, Pops, Dada etc. Fatherhood is not for all. Anyone can be a father to a child but not everyone deserves to be called a Dad. Dad is your hero and he is a good provider. He is your number one supporter when everyone seems to turn their back at you. On Father’s Day, it’s time to honor this superb creature we call Dad. Gift giving is celebrated on Father’s Day as a gesture of appreciation to our Dads. What do you have in mind? Any gift would do but a personalized gift makes it even more special. It would give him a feeling that his gift is especially made for him and that you have put much thought on his present. Check out our suggestions of the best personalized gift ideas for Dad. Munching is one of Dad’s favorite past time. He has a sweet tooth and he loves delicious treats. On Father’s Day, why not gift Dad one of his favorite treats but only better. This Giant Fortune Cookie with a dimension of 6 x 6 x 6 inches and weighs 3 pounds freshly baked vanilla fortune cookie dipped in your choice of white or dark chocolate, creamy caramel or rich Belgian milk. Each cookie is dipped and decorated by hand and beautifully placed in a cello bag with a bow and then carefully placed in a white glossy gift box which makes it ready for gift giving. 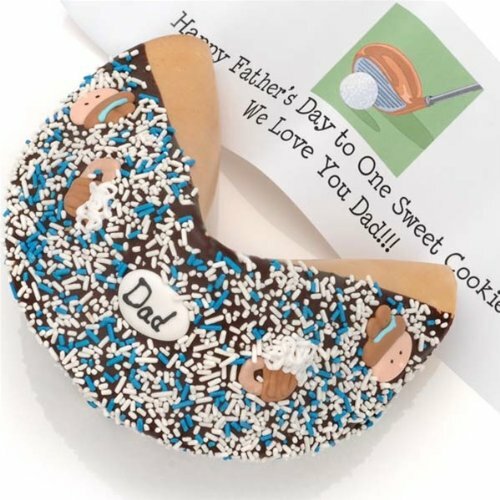 This fortune cookie is extra special since you can customize it with your Father’s Day message inside. It is a gift and greeting all in one. Tell him how fortunate you are for having him as your Dad not only on Father’s Day but in all the days to come. Barbecues on weekends are Dad’s favorite because this is the time that he can exemplify his grilling prowess. On Father’s Day, gift Dad a one of a kind Sportula that is made just for him. It has a hard maple handle with durable brass rivets. This Sportula is uniquely made with a laser cut design which states King of the Grill. Dad’s barbecues would definitely have his mark on it and would be known to his guests that the king of the grill made them. His Sportula is made just for him so engrave his name to make it more official. Names for up to 12 characters can be engraved. It’s not only a burger and meat flipper but also a bottle opener on the other end. Dad would absolutely find your gift useful and commemorative of him. Dad is special and you admire him for that. Only few men are like him and you want him to feel important and loved on his special day. On Father’s Day, give Dad a memorable gift by giving him a piece of your heart to him. This Dad Frame is a special frame with captions that are made especially for Dad. Put the best photo you have to make it even more special. You can personalize it by putting your own message below the photo for up to 20 characters. Include your name and of your siblings to remind Dad that his little angels adore him. It is a charming decoration to his desk at the office or at his library at home or anywhere he prefers to put it. This would surely give a handsome accent in anywhere it would be placed. He may be too busy most of the time but he still manages to spend time with family. He may look at the clock often because he always has meetings and appointments. He is a good provider so that’s why he does all these things for you. On Father’s Day, show Dad that your love for him is timeless. Give him this unique clock shaped into his favorite name “Dad”. You can even personalize it by adding your message and names. You can include up to 7 names with up to 10 characters each. This is an adorable piece which is perfect for his desk, bookshelf or mantel. Dad is such a great Dad and for you he is the greatest of them all. You want to tell the world about this on Father’s Day, so why not put it on the headlines? This mug is uniquely designed like a tabloid sheet with a special caption only for Daddy. Make it even more personalized by putting up your favorite photo too. Dad would absolutely find it amazing to have your weird idea come to life. He would be reminded how much you love him every time he gets his caffeine fix. This mug is available in different colors and he can put this in the dishwasher and microwave too. On Father’s Day, tell Dad how much you love him in a one of a kind way. This customizable tie says it all. Daddy would definitely be amazed on how creative this tie is. This tie is made from polyester and can be personalized by putting any title with the names of his children printed in a repeating manner. The title can be printed for up to 9 characters and the repeating names can include up to 12 names of up to 9 characters each. Your message for Dad will be posted on the bottom part of the tie. This special tie measures 57 inches in length. Dad can use this tie to work on Father’s Day or in any day he prefers. It is a truly a one of a kind gift that is made only for him. A personalized gift makes a great present for Dad because it adds a personal touch and makes an ordinary gift more stunning. You are assured that your gift would not be just another gift and there would definitely be no doubling up! Make Father’s Day a happy day for Dad, aside from your gift, give him more hugs and more thank you too.